"Growing up we always had an abundance of rhubarb from the garden. This was a way for my mom to use it up and treat us as well. Nice addition to ice cream, pound cake, or all by itself. You can substitute any berries for the strawberries." Stir brown sugar, rhubarb, strawberries, vinegar, cinnamon, allspice, cloves, and nutmeg together in a saucepan over medium heat. Cook and stir until relish thickens, about 30 minutes. Cool, transfer to a sealable container, and store in the refrigerator. 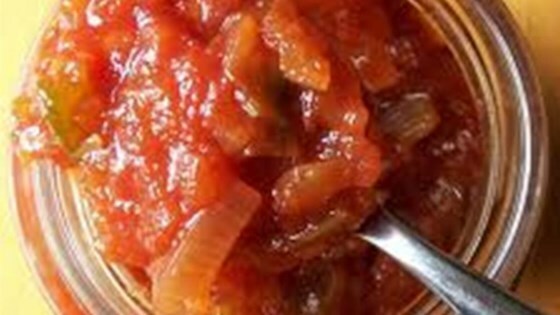 To thicken the relish more quickly add 1/4 teaspoon cornstarch.